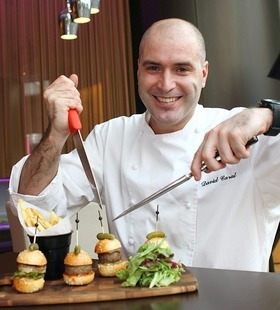 Circus’ chef David Caralclowns around with agiant fork and knife as hepretends to cut the miniburgers in the SlidersTasting Platter. Tel: 03-2141 6151 or www.circus.com.my. It’s your palate that will be entertained at this unusually named restaurant. IT’S unusual for a restaurant to choose “Circus” as its name. It may be a laughing matter to some, but the gimmick seems to have worked. What’s behind the name anyway? Aren’t you curious? And when you find out, you tell others. News travels and that pulls in the crowd – that’s the idea, anyway. Of course, the grub, service and entertainment have to do it justice. “Circus is an intriguing name that can focus on the social circus. It’s about letting people wonder what Circus is. Is it a real circus with elephants and clowns?” asks Ralph Zeidan, sales and marketing director of the restaurant, which won several awards at this year’s Malaysian International Gourmet Festival. Food, Zeidan says, is “international cuisine at its best”. “From quesadillas to foie gras to codfish to wagyu beef, it’s really diverse. There is something for everyone. At lunch, many people order sandwiches and sliders or mini burgers (which can be an appetizer to share or a diner’s full meal). Wood-fired pizzas are delicious and women take salads,” he says. The beverage menu boasts over 60 cocktails from forgotten classics to the avant garde – there’s a Vintage selection for the nostalgics, Molecular cocktails for the adventurous or the Moods Of Circus cocktails to accentuate or alter your state of mind. We start with the appetiser, Tasman Bay Seared Scallop (RM34) with Orange-Soy Glazing, which is just a neat row of four scallops and little else. After the plate is photographed, only two scallops make it to the tasting – and neither I nor the photographer Brian Moh had any. Looks like somewhere along the way, someone had a little taste! Zeidan eats one and leaves the other for me. I can’t bring myself to devour the whole scallop myself despite not having had lunch and it is close to 4pm, but I want to save half for Brian, who is still fussing over his photo shoot. The appetiser appears simple but don’t underestimate how it’s cooked. There’s still quite a bit of preparation involved. You may not have guessed that the scallops are marinated in a caramelised orange-red wine sauce, sauteed and then glazed. I feel wealthy already, having eaten half a “golden” scallop and shared my wealth. Taste wise, it was fresh with its light tangy flavour. Circus executive chef David Caral is from Barcelona, Spain, and he brings with him 18 years of vast culinary experience to this first international cuisine outlet of the Entertainment Group. Next is the Grilled Calamari Salad, which is a steal at RM25. The four chunky calamari cuts are laid out strategically on the four corners of the plate with a heap of salad in the centre. The seafood teams well with a perfect dressing of fresh cheese cream and tomato vinaigrette. The outer part of the calamari is firm to the bite and the inner is slightly soft and juicy. We give the thumbs up to Zeidan’s recommendation of Piccata al Limone (RM58) for the main course. The dish – buttery pan-seared tender white veal fillet with lemon sauce and capers – is truly satisfying. There are three fillets, so sharing is easy. A dish to share: There’s a lot of Chicken Fajita to go around. Chili Beef Pie (RM36), the second main course, which Zeidan wants us to try is sold out. 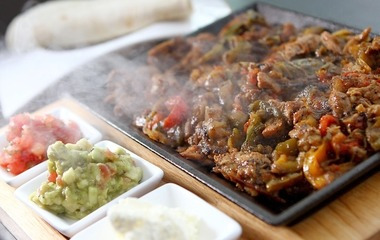 Instead, the jolly good Circus culinary artist Caral surprises us with a replacement, Chicken Fajitas with Onions, Capsicum, Guacamole, Sour Cream and Pico de Gallo (RM36). Each of us wraps the stir-fried marinated boneless chicken strips, a salsa of chopped fresh tomato, white onion, and chili, guacamole and sour cream in a tortilla. The shared dish is almost polished clean. 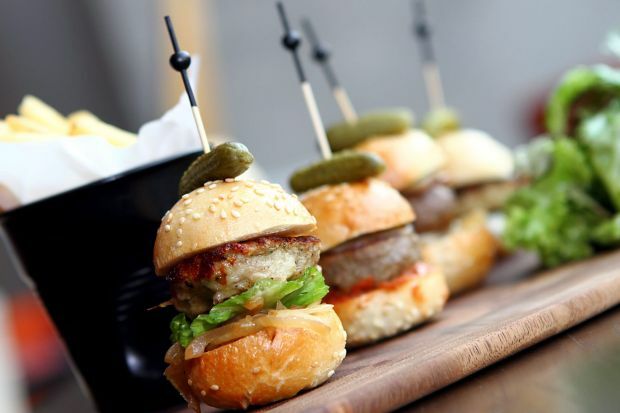 Sliders Tasting Platter (RM42) is a terrific sampler set of four mini burgers and a heap of greens. As it is to be shared, I select Chicken Cordon Bleu. As I bite into the oreo-sized chicken patty, I can taste the gooey goodness of melted Swiss cheese. Yum. Engrossed in my indulgence, I am unsure what my two male companions are having. Between them, they have their pick of Buffalo Chicken, Wagyu and Sirloin Sliders. Fondant Au Chocolat (RM20) with Toffee Vanilla and Vanilla Sauce and Vanilla Ice Cream is a sweet serenade to end our tasting review. As each of us scoop up a bit of the flourless chocolate cake made with bittersweet chocolate, “the chocolate lava” flows out. The taste certainly melts our hearts. Zeidan’s drink tempts me to order one for myself. Spring Time Boost (RM15) is a mocktail of cranberry juice and lemon juice with a fruit skewer of raspberry, strawberry and blackberry to tease the palate. Circus has dinner shows and resident deejays a few nights a week. Check out their website for the line-up. The outlet is also serving Christmas Eve and New Year’s Eve dinners this month, as well as its Christmas Champagne Brunch. Circus is definitely worth a visit. At night, the restaurant is more inviting as it transforms its ambience and flaunts its electic interior even more, with lights and the happy-hour crowd. Be part of the social circus!